And Why Do I Want One? Does the idea of a backyard waterfall appeal to you? 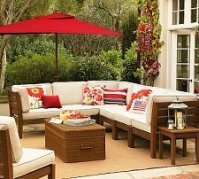 Are you concerned about having enough room in your backyard? Or maybe you are concerned about the maintenance requirements for a waterfall and the pond it runs into. A pondless waterfall will help you with either or both of those concerns. A backyard pond is a great feature, but not everybody wants one. Or maybe you want a backyard pond, but can't afford it right now. If you leave room for it to be added later, you can have the waterfall now, and the pond can come later when you are ready. The waterfall system itself is essentially the same either way - the difference is how the falling water is handled at the bottom of the waterfall. If you want a pond - great! A traditional backyard waterfall system may be what you want. If not, read on. 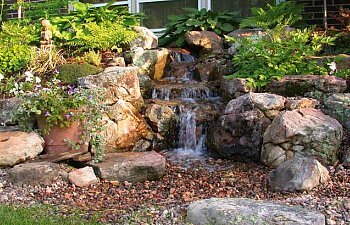 With a pond free system, your waterfall will fall into a receiving area of stone or gravel. Under the rocks there will be a reservoir where the water is collected and pumped back to the top of the waterfall. First, let's be clear - there is nothing wrong with a backyard pond. 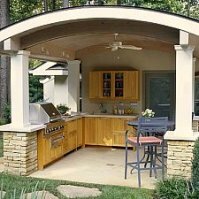 They make beautiful and fascinating features when included as part of a backyard design plan. But they are not needed or wanted by everybody. There may be space or slope issues that make them impractical, or you may not want to take on the maintenance requirements of a pond. 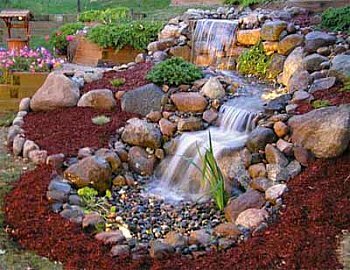 Whatever the reason, if a pond is not in your plan, you can still have a backyard waterfall. Obviously, the lack of a pond makes a waterfall system easier to maintain. You will need to add water as it evaporates, but that's about it. The deeper water of a pond may be a safety issue as well, particularly if small children are present. However, even a pondless waterfall may have places where there is enough water to be dangerous for very young children, so be sure to keep the kids safe. Another advantage of a pondless waterfall is that it can be turned off when not in use. You can turn on the waterfall anytime you want, or you can use a timer to have it run at pre-determined times. When freezing weather comes around, your weatherization process is minimal. Just turn the system off, make sure the lines are drained above the frost line, and wait for spring! A pond needs to be operated 24/7 year round if fish are present. If you have a vacation home or a second residence, you can now have a waterfall without worrying about the maintenance requirements. When the water from your waterfall gets to the bottom of its journey, it has to accumulate in something. You can dig a hole and place a liner in it, place your pump at the bottom of the hole, and it will work. But you don't want just a hole filled with water, so you fill the hole with gravel. But the gravel takes up the room that you needed for the water. You need to have an open space under the gravel to provide enough room for the water to accumulate, and to keep the pump from being clogged or damaged by the rocks. In the picture above, you can see the finished waterfall in the top photo, while the lower picture depicts what the underground part of the system might look like. 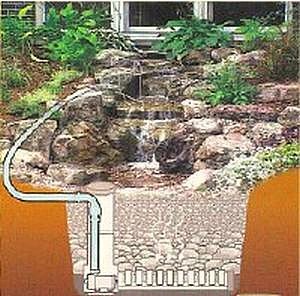 Your pondless waterfall will actually be falling into a "pond", its just that the pond will be hidden under the rocks and gravel. Some folks have used milk crates or other similar plastic boxes to create a void for the water. In theory, that makes sense, but in practice, dirt, small gravel, and other debris tend to get inside the box and then clog or damage the pump. These improvised systems may seem like a good idea at the time, but you will be much happier in the long run with a reservoir that was designed for a pondless waterfall. By far, your best bet is to purchase a kit that includes a reservoir tank with a pump inside. You simply put the tank at the bottom of the hole and cover it with decorative gravel and stones to match your design scheme. Spend a little more now, and avoid "fixing" your cheaper version later. Depending on your abilities, this can be a do it yourself project for many homeowners. 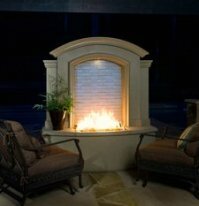 If you don't have the time or the ability, a professional installation can be accomplished very quickly in most cases. 4) More flexible - use it when you want it, then turn it off. What's not to love? Get started today and you can be enjoying your backyard waterfall in no time!